Facing an early deficit off a freshly stalled drive — in which the offense failed to convert on its quixotical longball and between-tackles run plays — Andy Teasdall’s kick narrowly escaped the outreached grasp of his backfield trespassers. 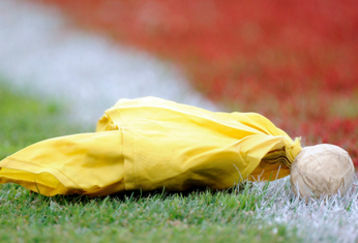 One of them collected his plant leg, and he dutifully crumpled in a heap, enabling a fresh start for his team met by that trusty deterrent, the personal foul roughing call. Clemson didn’t look back, as ScElliott found the corner pieces of BC’s defensive jigsaw puzzle. When the final whistle blew, over half a dozen Tigers put their mark on 532 yards of total offense. Some of this production can be attributed to an awful starting field position, but it shows that this team can sustain drives against the best fronts, and move it when backed up deep. That Brent Venables defense was once again up to the task, limiting freshman quarterback and newly-minted starter, Jeff Smith, to a 15.9 QBR on 7/22 for 87 yards passing. The Eagles had more luck on the ground, averaging 4.5 ypc on 38 rushes, and extended drives throughout the game. BC also amassed two big plays, but neither ended up impacting the outcome. Best of all, the Tigers avoided the injury bug on defense. At the midway point, let’s reflect on the year to-date and what lies ahead. The Tigers weathered their toughest 3-game stretch of the season, and won the next matchup handily. Since opening kick versus Wofford, Clemson’s suffered a single meaningful injury to a starter. But man, what an impact it’s had. Sidelining Mike Williams — the anchor of the passing game and human safety blanket for Deshaun Watson — has indeed limited the ceiling of your Clemson Tigers’ offensive production. Fortunately, the defense has picked up all of the slack and then some. Remaining healthy, as STS’s Ryan Kantor detailed masterfully, will be critical to ongoing success on both sides of the ball. As we look at the remaining 6 games — @Miami, @NC State, home vs. Florida State (AP No. 9), @Syracuse, home vs. Wake Forest, @South Carolina — what stands out to me isn’t just that FSU matchup, but the cluster of road tests. Sun Life Stadium won’t be winning any attendance contests, but it’s also the site of Clemson’s most humbling game in memory, and this may be Al Golden’s most talented roster yet. Raleigh has been a place where Clemson ambition’s gone to die in the recent past. The yankee orange team would relish nothing more than to elbow their way into this league with a signature upset. And could a rejuvenated Gamecocks team under interim coach Shawn Elliott step up and slay Goliath? Only a prepared and focused team will survive this slate — and displace a resurgent Florida State squad from the ACC throne. Have we seen this Clemson team play a flawless half, let alone game? Not particularly. Do they possess the means of beating any of these teams multiple ways? Definitively so. In-game coaching adjustments and utilizing the depth of talent paved the way to victory over BC. Coupled with Clemson’s special brand of discipline, this bodes well for the weeks ahead.